Malta is an island located in Europe. It is near the center of the Mediterranean Sea, south of Sicily. The capital of Malta is Valletta. Around 400,000 people live in Malta and it is one of the most densely populated countries in the world. Because of this, it has many cities and towns that grew close to each other over time. Maltese is the national language of Malta, with Maltese and English serving as official languages in line with the constitution of the country. A majority of the people of Malta can speak three languages; Maltese, English and Italian. Malta became well known as the base of the Knights Hospitaller. They moved to Malta after being forced to leave Palestine and then Rhodes, in Greece. In 1565 they survived a great attack by the Ottoman Empire. The history of the knights at Malta continued the strong Roman Catholic beliefs in the country that were started by the Norman and Spanish rulers. 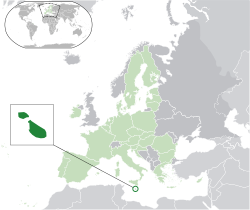 In 1798, Napoleon took control of Malta. The French rule was not popular and in 1800 Maltese rebels invited the British Royal Navy to come to the island. This led to 200 years as a British colony and independent Commonwealth member. ↑ Zammit, Andre (1986). "Valletta and the system of human settlements in the Maltese Islands". Ekistics (Athens Center of Ekistics) 53 (316/317): 89–95. This page was last changed on 28 February 2019, at 15:41.